December 30: A PILDAT Analysis on Performance of Pakistan Railways shows that while major challenges remain for the country’s largest passenger and freight network, the past two years since 2013 have shown improvement in the performance of Pakistan Railways. Pakistan Railways’ earnings have increased and its punctuality rate is up from 53% in 2013 to 70% in 2015. The Railways was able to exceed its targeted earnings during 2014-2015 and reduce its financial deficit. These improvements have come about through larger investments in infrastructure development, purchase of new operational locomotives and an increase in quality of services. However, the sustainability of this trend will depend on the political will of the top political leadership and continued dedication of the Railways Team to the mission of turning this crucially-important State institution around. At a Briefing Session, organized by PILDAT to discuss the performance of Pakistan Railways, key stakeholders critically evaluated the Railways Performance and offered recommendations and a way forward. 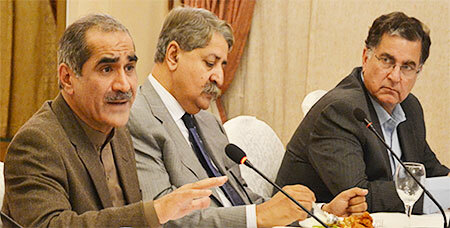 Among others, Khawaja Saad Rafique, MNA and Federal Minister of Railways, Syed Naveed Qamar, MNA and Chairman National Assembly Standing Committee on Railways, and Senator Nauman Wazir Khattak, PTI, shared their perspectives at the Briefing Session. “Priority was given to de-politicising Pakistan Railways in order to ensure turnaround of this important State Institute.”– Khawaja Saad Rafique, MNA, Federal Minister of Railways. Among other key state institutions, the Pakistan Railways sits atop the ever-burgeoning pile of poor governance inflicting Pakistan. The deteriorating quality of services and declining number of passengers and trains in Pakistan Railways, which once used to be the predominant mode of transportation in Pakistan, offers a classic case study in lack of vision and will over the years. At its peak between 1955 and 1960, the Railways handled 73 per cent of freight traffic, which fell sharply down to less than 4 per cent in 2015. During 1970s, Pakistan Railways also had the largest passenger carrier share in transportation. Participants deliberated upon the reasons for the huge setback to Railways’ role as a catalyst for economic development. While significant under-investment by successive governments in Railways is one reason, lack of political focus and commitment to the country’s key State institution was considered to be the reason at the heart of the issue. As part of its focus on improving quality of governance, PILDAT periodically monitors the quality of performance of key State institutions with a view to highlight the issues and offer recommendations for strengthening these institutions. PILDAT study in analysing the performance of Pakistan Railways is an attempt to showcase the state of affairs at this important institution of the State and present to the citizens and policymakers alike some of the recommendations that can help improve the Pakistan Railways. PILDAT analysis is prepared with support and collaboration of the very institutions whose performance is evaluated and we are grateful for the support provided by the top political and technical management of Pakistan Railways in preparing our performance analysis. The briefing session was followed by a discussion session where participants, including parliamentarians, government officials, esteemed members of media and civil society discussed the way forward for Pakistan Railways.